Similarities in chemical composition between the ice (H2O) and quartz (SiO2) result in significant parallels between several of the solid forms of frozen water and those of SiO2. For example, tridymite and cristobalite (both SiO2), which are found in volcanic rocks, resemble two of the many different crystal structures of ice stable at varying pressure and temperature. For decades, it has been predicted that a form of ice with a quartz-like structure could be created in the laboratory, but until now, the goal of isolating this material has remained elusive. The research team, including EFree Associate Director Tim Strobel and EFree Director Russell Hemley, report that a new hydrogen-containing phase of water ice appears very low pressures (400 MPa) and at 273 K, slightly above the freezing point of pure water. 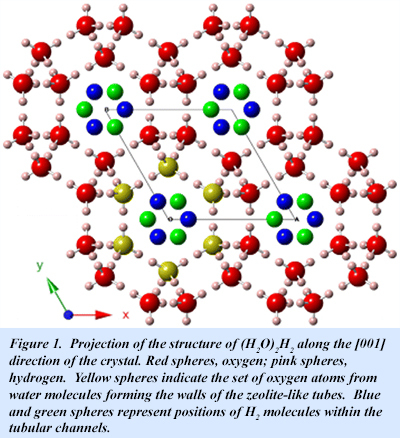 Advanced x-ray diffraction and Raman spectroscopic measurements reveal a complex arrangement of H2O molecules very similar to that adopted by zeolites, which are largely composed of SiO2 (Fig. 1). Stuffed with hydrogen molecules, the new phase has the chemical formula (H2O)2H2. The crystalline structure of (H2O)2H2 consists of interconnected helical chains of water molecules forming tubes along a single direction of the crystal. The tubes are filled with hydrogen molecules to a ratio of one hydrogen molecule for every two water molecules. (Fig. 2). This substantial molecular hydrogen content within large water channels helps to enable enhanced hydrogen mobility, a feature that may facilitate future practical applications in the area of renewable hydrogen storage. While quartz is the most abundant rock-forming mineral found in Earth’s crust, this water-based structure with a similar atomic arrangement might be found in abundance on icy planetary bodies under conditions similar to those under which it was created [T. A. Strobel et al., J. Am. Chem. Soc., 10.1021/jacs.6n06986 (2016)]. Figure 2. Animation illustrating the helical nature of the tubular channels in the (H2O)2H2 structure.